A new chapter in Singapore's sporting history was written last night as the country extended a heartfelt welcome to the region's top para athletes at the 8th ASEAN Para Games (APG) opening ceremony. The 90-minute spectacle featured more than 1,400 performers - able-bodied and people with disabilities - and was divided into five acts. Each celebrated the enduring journey of a disabled athlete. Declared open by President Tony Tan Keng Yam, the week-long Games will see about 1,200 para athletes compete in more than 300 events. The Republic is hosting the APG for the first time and has offered a record 15 sports. Among those at the Singapore Indoor Stadium for the sold-out show were Deputy Prime Minister Teo Chee Hean and Minister for Culture, Community and Youth Grace Fu. In her opening address, Ms Fu hailed the athletes. "You have overcome challenges in life and shown us that sport is truly without boundaries. Your fighting spirit will inspire us to live better through sport and spur us to face life's challenges with courage," she said. The loudest roars from the 6,000 spectators were reserved for Team Singapore's 154 representatives, led by flag bearer and swimmer Yip Pin Xiu. She later joined badminton player Tay Wei Ming and nine-year-old Aloysius Gan, who has cerebral palsy, as the final torchbearers to light the Games' cauldron. There was more to cheer as Singapore beat Indonesia 1-0 in yesterday's opening match of the cerebral palsy football tournament. 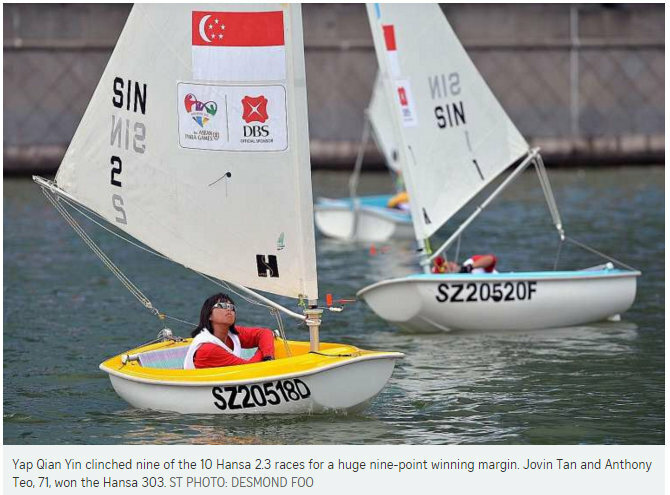 Separately, sailors Jovin Tan and Desiree Lim yesterday secured their spot at next year's Paralympics in Rio. The two, however, will be racing against each other in the Hansa 303 class at the APG. 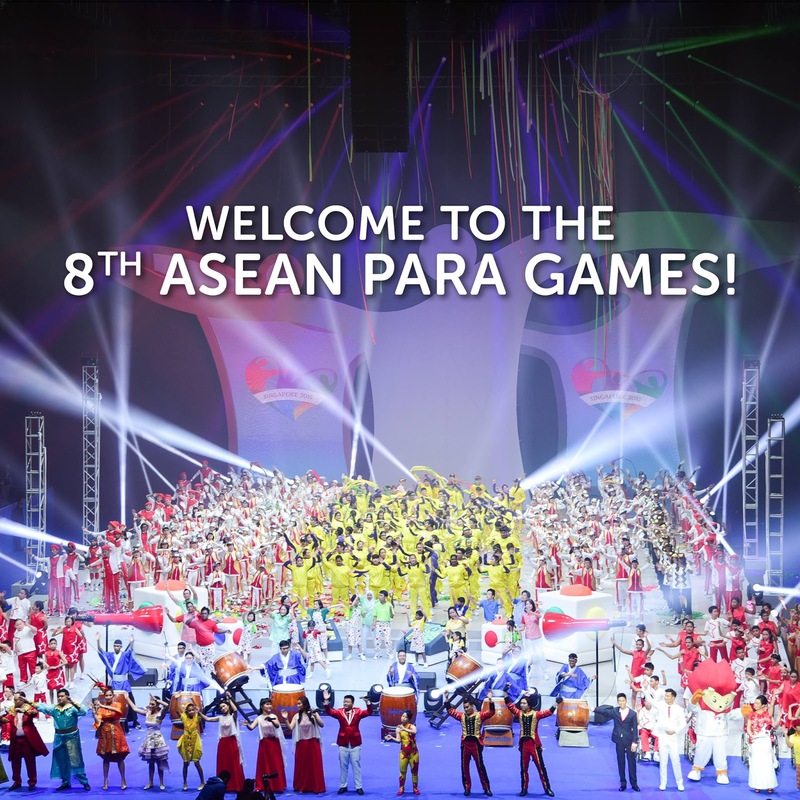 The spotlight finally fell on athletes too often left in the shade as the ASEAN Para Games (APG) opening ceremony delivered a thoughtful message to the watching world. Crafted with the struggles people with disabilities encounter in mind, last night's 90-minute show was full of symbolism. 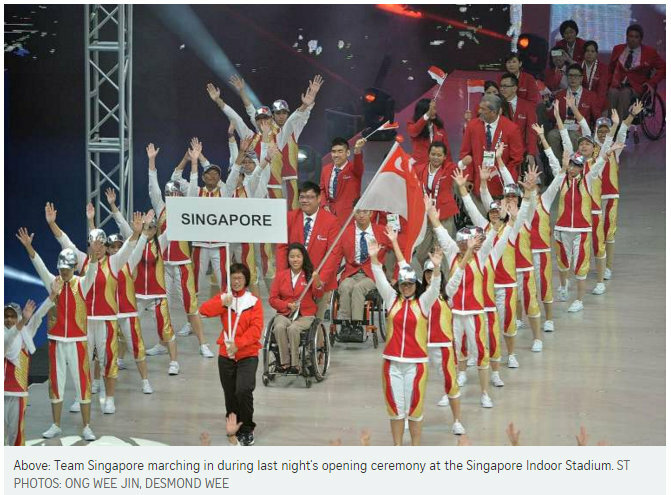 From an autistic teen dancer to a choir led by hearing-impaired singers and musical acts performed by students from local special needs school, the Singapore Indoor Stadium was rich with the theme of inclusiveness and tolerance. For the first time, the opening ceremony was broadcast live to other countries - Thailand, Malaysia and the Philippines - besides the host nation - and included sign language interpreters on stage and live captioning. As first-time host of the APG, the Republic is hoping to leverage on the event to promote greater social integration. People with disabilities form about 3 per cent of the resident population. Said Minister for Culture, Community and Youth Grace Fu: "The APG is not just a sporting competition; it is a milestone for every Singaporean, as we mark the start of a movement to build a more inclusive society through sport." The hosts are fielding a record 154 athletes to compete in all 15 sports, more than three times what the Republic has sent to the seven previous Games. This edition will feature 1,200 athletes - including several Paralympic champions like Thai stars Rungroj Thainiyom (table tennis) and Prawat Wahoram (wheelchair racing) - with free entry to all events until the final day of competition next Wednesday. Expect memorable moments "that will inspire and move us all in many ways", said ASEAN Para Sports Federation president Zainal Abu Zarin, who helped launch the inaugural APG in Kuala Lumpur in 2001. For Huzaini Mahbob, this was a priceless opportunity to watch his 26-year-old son Dinie Asyraf, who suffers from a spinal injury, compete in the table tennis event. Said Huzaini, 53: "I am very proud of him, not everybody has a chance to represent Singapore." Added swimmer Yip Pin Xiu, who is the country's sole Paralympic Games gold medallist (Beijing 2008) and will compete in three events at the OCBC Aquatic Centre: "It's really special that the APG is finally here. "It signifies that Singapore is moving forward and stepping into a whole new level for para sports." Surpassing Singapore's best haul - 16 golds, 10 silvers and 11 bronzes won at the 2001 edition - will undoubtedly raise excitement levels. Said Tay Wei Ming, a two-time APG badminton champion competing in his fourth Games: "I think we can do very well. "Morale is high among the contingent with the support of the public. We are very motivated." Such is the significance of putting torch to cauldron at a home Games that even Yip Pin Xiu, a veteran athlete of major events who has reached the pinnacle of her sport, could not help but be overcome with emotion upon being handed the honour yesterday. The swimmer, Singapore's only Paralympic champion, was among seven athletes chosen to take the ASEAN Para Games (APG) torch on its final leg inside the Singapore Indoor Stadium yesterday at the opening ceremony of the biennial event. She joined hands with badminton player Tay Wei Ming and nine-year-old boccia player Aloysius Gan - he is too young to compete in the Games - as the final torchbearers, lighting the cauldron to signify the official start of the APG. She had fretted that her hands, which have weakened over the years from muscular dystrophy, would not be able to hold the torch firmly. Yip, 23, even joked that there were fears that her hair would catch fire from the flame. But when the moment came, it was simply one thick with meaning. "The sense of pride I have is very different from winning (at the 2008 Beijing Paralympics)," she said. "To be able to light (the Games' cauldron) is really special. "I never imagined that the APG at home would be such a big thing. "This is not a personal achievement. It's the whole country's. I'm so proud to be doing this, so proud to call myself a Singaporean." Tay, a two-time APG champion competing in his fourth Games, was asked to be a torchbearer about two months ago, but never dared dream of being given the ultimate honour. "This is something that I've never experienced and an opportunity that not everyone has," said the 27-year-old, whose parents watched with pride yesterday. Other torchbearers were powerlifter Kalai Vanen and swimmers Benson Tan and Toh Wei Soong, and shooter Aishah Samad. The APG marks a triumphant comeback for Aishah, after a bacterial infection in 2012 led to the amputation of all four limbs. The 2003 SEA Games bronze medallist said: "Even when I was able-bodied, I didn't have chances like this. "I lost four limbs but I got a lot more than what I've lost. I'm amazed with everything around me, with myself, with destiny." Handing Aloysius - he suffers from cerebral palsy - a role in lighting the cauldron was also a nod to the future of disability sports here. He won gold in the BC3 pair event at the National Disability League this year. Said Tay: "Having him (light the cauldron) with us signifies that disability sports will continue to be nurtured in Singapore." Moments after the finest moment of his career so far, Khairul Anwar Kasmani recalled vividly his childhood days spent at the old National Stadium, cheering Singapore's football icon Fandi Ahmad in the 1990s. He dreamt of playing for his country. He dreamt of playing in front of his home crowd. He dreamt of scoring a goal in a red shirt. And, yesterday morning, all those dreams came true. With a minute left on the clock, Singapore's cerebral palsy football team captain hammered home a ferocious shot from 25 metres out to secure a 1-0 win over Indonesia in the opening match of the 8th ASEAN Para Games (APG). That gave the hosts a rousing start to the Games, even before the multi-sport event's opening ceremony in the evening. Khairul said: "It's a dream come true. I watched Fandi Ahmad and Indra Sahdan play during those days a long time ago. "Everybody surely wants to score at the National Stadium. "It feels special. We have always played our matches away and there's not much of a celebration (when the team score). "But this is a totally different feeling. It's overwhelming." Throughout the 60-minute, seven-a-side game played on a smaller pitch, the 29-year-old was at the heart of the action. Launching himself into tackles, initiating attacks with his passing and, ultimately, leading by example through his winner, the defender buzzed about the Kallang pitch, fuelled by his dreams. And he hopes the win, which gives Singapore a headstart in the round-robin group, will ignite a string of victories from the rest of the Team Singapore contingent. Khairul said: "It means a lot not just to the team, but the whole Singapore contingent. "It's a curtain-raiser and I hope that it will give a boost for them to perform even better." The crowd of 1,730, who cheered incessantly for both teams, were impressed by the players' efforts. Housewife Goh Gin, 53, said: "I was surprised at how well our players played. I was impressed with their teamwork and how well coordinated they were. "Actually, it's not easy for them to run so much for 60 minutes and you can see some of them struggling with their balance. "But they showed great fighting spirit. I especially like the way Khairul played because he is so strong. It was as exciting as a normal football match." Khairul added: "We didn't want to disappoint the fans. "Every chance we tried, they would cheer, they were fantastic." The defender is one of two C7 players in the team. The higher the classification for the player, the lower is his disability. Even though Singapore had the game's only C8 player (Abdul Mahdi), Indonesia, participating in their first-ever competition since their team's formation eight months ago, fielded a stronger squad with five C7 and two C6 players. But after the thrilling win, Singapore coach Mohamed Zainudeen was satisfied, saying: "We didn't know what to expect and we didn't underestimate them. "It was an even but tough game and a fantastic fight. "There were instances of (good) crosses and free kicks, we worked on these during training. "So many positives to take away from this game. It's a good start." Singapore will take on champions Myanmar tomorrow in their next round-robin match in the five-team event. Their opponents had beaten the Republic 2-0 in the final at the previous APG last year. As I went through my usual routine a day before competition yesterday, a lot felt familiar - more so than at the other major events that I've competed at. For starters, when I did a few easy laps in the morning in the infinity pool of the Marina Bay Sands where all the athletes are staying, it was the familiar Singapore city skyline that served as my backdrop. Competing at the APG is also something I know well. This will be the eighth time I've got the red and white of Team Singapore on my back, the eighth time I'll dive deep into the pool in search of glory for country at the Games. There are the usual pre-race nerves, which show up right on cue, no matter how many competitions I've been to. Yet, at the same time, it is also an entirely new sensation. This time, I am home. When I competed at the first APG in 2001 in Kuala Lumpur, there were only two sports contested. I was still a wide-eyed 14-year-old, but I knew then that the APG had potential. Still, never did I think that it would amount to something like this. The build-up to, and support of, this APG has been nothing short of incredible. As I sat inside the Singapore Indoor Stadium watching the opening ceremony last night, I felt so proud to know that it is my country that is putting these Games together. It is heart-warming to see, hear of and know that there is a whole nation backing us and rooting for us at these Games. For us athletes, it serves as extra motivation and I, for one, know that I will be giving all that I have in the pool. Today, I will again go through a routine I've done hundreds of times before, as I get ready for the 100m freestyle and 100m breaststroke races. I'm stocked up on the pre-race food I need to fuel my body, I've got my competition suit, swim cap and goggles all packed in my bags. I know I'm prepared for competition. My new experience this time is knowing that I'm at home and I've got friends and family on my side and up in the stands. It's a new feeling, but it's a good feeling, and I can't wait. Think you know all the 15 sports competed in ASEAN Para Games? Test yourself with our fun infographics and find out if you really know these sports inside out! It was the final frame of the sixth and final game. 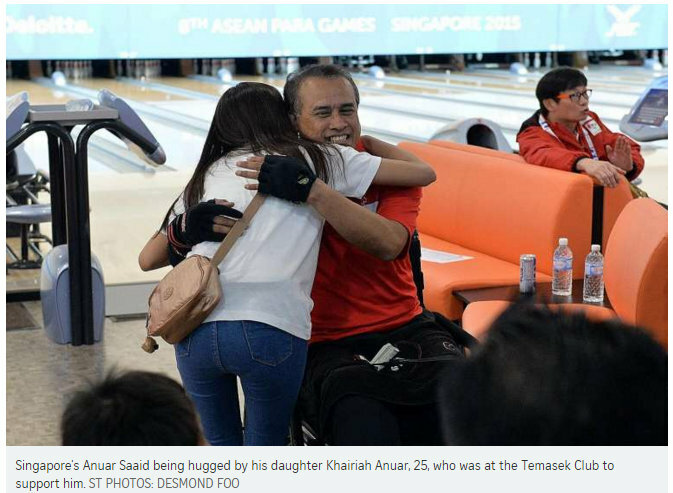 Anuar Saaid needed just eight pinfalls to seal the Asean Para Games (APG) gold medal. Sitting in his wheelchair, the Singaporean, a right-leg amputee, stared at what was ahead of him as he visualised knocking the pins over in his head. The ball left his hand, before curving in the middle of the lane. Bang! Nine pins fell, and so did the gold - into Anuar's hands. He totalled 838 pinfalls to pip Franciso Ramirez Ednaco of the Philippines by a mere two pinfalls. The medal was an early birthday present to himself as he turns 54 on Dec 12. Said Anuar, whose previous best result at the APG was a bronze in the TPB8 category, for those with spinal cord injuries, in 2011: "I didn't know it was such a close game and my coach also didn't tell me. "My coach just told me to try my best and that I could do it and just kept encouraging me, telling me to relax and enjoy my game and I wasn't thinking about the results. "This medal is not only for me, but for my team, for Singaporeans, for my supporters, family, team manager, president and all my friends, who came to support me." Anuar's was one of three golds hosts Singapore won yesterday at Temasek Club. The other four golds on offer went to Malaysia. Mohamed Ismail Hussain, 32, retained his mixed singles TPB3 title for the visually impaired, from four years ago in Solo, Indonesia when the sport last featured. But a newcomer to the rostrum was Mohamad Rausyan, 21. He topped his category, TPB4 for the intellectually disabled, with a 1,092-pinfall effort, 13 ahead of compatriot Eric Foo, who was second. And while Singapore's Muhammad Farhan Ismail and Nixon Fan were third and fourth respectively, they were not awarded medals as Games rules stipulate that a country can win a maximum of only two medals in any event. The bronze thus went to Ye Phone Maung of Myanmar (730). Said Rausyan: "I enjoyed bowling today and I am happy to win gold." Rausyan's mother, Sumpina Taib, 49, said: "I'm very happy and proud of him to see that all his hard work and sacrifice has paid off. I hope that his win can create an awareness of what disabled children or people with disability can do." And while this APG may be the 21-year-old's debut in bowling, team manager Darren Khemlani said: "This win did not come as a surprise because the four of them have been training very hard for this competition, so they have all put in their best effort and have all done their part, so as a team manager, I am very happy for all of them." As for Ismail, the gold medal came as a surprise to him even though he was the defending champion. "Normally, I flop in my singles and I don't do well," he said. "I usually do well in my doubles, so to win today (in the singles) is a boost for me. "But what was sweeter was the fact that it was a back-to-back gold for me since my last Games outing." He will attempt to deliver again in the mixed doubles today with Thomas Yong Phen Chong. However, his main priority will be to focus on the process. "Hopefully, we (Thomas and I) can do something together... but my main goal is to keep on doing all of my processes and apply whatever I have learnt and not think so much," he explained. Singapore also bagged one silver and one bronze. With great joy, Jason Chee raised his right - and only - hand and saluted the screaming crowd as he savoured an unforgettable night for para-table tennis in Singapore. 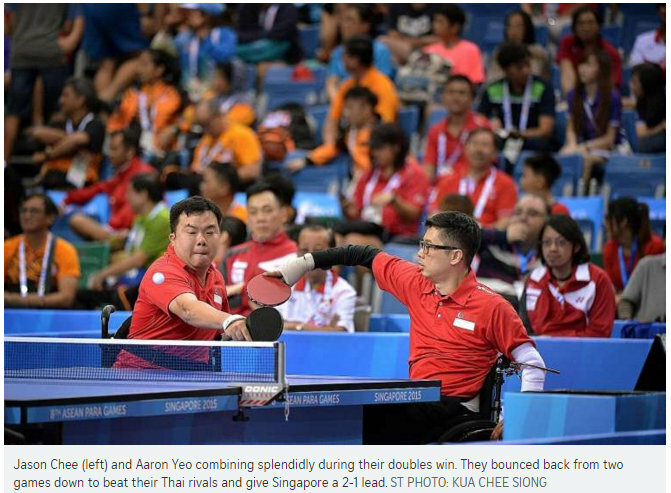 Never before had the country won a gold at the Asean Para Games, with five bronze medals at last year's edition the only silverware the Table Tennis Association for the Disabled Singapore (TTADS) could boast of. That was rectified last night when Chee delivered on his pre-tournament promise of an SG50 gold by winning all three of his matches to lead the men's team to a 3-1 victory over Thailand. Said the navy serviceman, who lost his legs and left arm in a ship accident in 2012: "This is the greatest achievement of my sports career. "I started to play table tennis on a wheelchair in June 2013 and wanted to get a gold medal for my life. It was not an easy fight but I achieved that today. It feels awesome." With only two teams involved in the classification T1-2 contest, the visitors had seized the initiative at the OCBC Arena by taking the opening singles as Eric Ting fell 7-11, 10-12, 5-11 to Natthawut Thinathet. Chee drew the Republic level with an 11-7, 11-7, 11-3 win over Nipon Theptoranee. The crowd at the near-capacity 855-seater Hall 1 - who included Minister for Culture, Community and Youth Grace Fu and Minister for National Development Lawrence Wong - sensed a revival on the cards. As the cheers got louder, the fightback became more palpable when Chee and team-mate Aaron Yeo recovered from a two-game deficit to defeat Nipon and Natthawut 7-11, 7-11, 11-6, 11-8, 11-9 to give the hosts the lead. Said Yeo, 36, who is a tetraplegic and making his APG debut: "That was the turning point in the match. "I was a bit nervous at the start and played poorly. But Jason is more experienced and he calmed me down and refused to give up." The new partnership was a tactical move by national coach Chia Chong Boon, a four-time SEA Games gold medallist. He picked Yeo ahead of Chee's regular doubles partner Darren Chua because Yeo was a better receiver who could handle the Thai's side-spin serve. The presence of Chee, who won a team bronze at last year's APG in Myanmar, was also a decisive factor, noted Chia. "Jason is very solid, he's my rock. I knew he would deliver two points in the singles." His confidence was not misplaced. 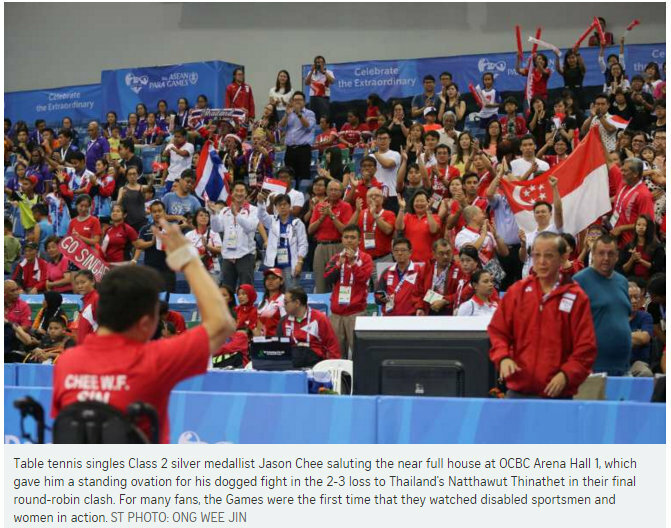 Chee beat Natthawut 5-11, 11-4, 11-7, 11-8 to deliver a historic gold for Singapore as the local spectators rose in acclaim. Said the die-hard Arsenal fan: "It felt like a football match in here tonight with all the fans supporting us. They were amazing. This medal is for them, as well as for my friends and family, my navy colleagues, my association and my mother who passed away in 2011." Yesterday's gold was the high point in an otherwise poor outing for local paddlers in the team event - they lost 16 of their 17 matches - that began on Friday. But the future remains bright, said TTADS president Kevin Pang. "A lot of them are debutants and will learn from this experience. Look at Jason, he started two years ago and now he's a champion." The man who was told he would never be able to walk or run again has defied doctors' orders - and there is no stopping him. Zac Leow finished second in the men's 1,500m T37 at the Asean Para Games yesterday to deliver Singapore's first athletics medal at the meet since 2011. He timed 5min 44.49sec, 20sec behind Indonesia's Timin, who set a Games record of 5:24.62, but well ahead of third-placed Nguyen Huu Tinh of Vietnam (6:12.51). The feat was all the more impressive as it was only the 29-year-old's second competitive event since picking up competitive track and field in February. More remarkably, doctors had deemed him unable to walk or run after the PhD (sports science) student at the University of Western Australia was left paralysed after a cycling accident in Australia two years ago. However, he refused to accept his fate and slowly learnt how to "sit up, walk and everything" again. Through sheer determination, he proved his physicians wrong and was running again this year. He said: "I'm glad I was stubborn enough to do what I wanted to do. "Through divine intervention - if you believe in it - that's what brought me to where I am today." 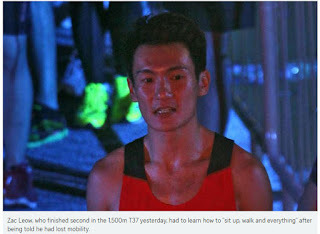 Having regained his ability to run, Leow approached the Singapore Disability Sports Council, stating his interest in running. Still, preparing for his first Games was one of the most challenging tasks he has undertaken. As he was overseas, liaising with team manager Loh Ngiap Kiang to make sure his training results were accepted required a lot of effort. Then, there were "administrative issues" because Leow trains under an Australian coach. But Loh was there each step of the way - even when Leow failed to qualify for the International Paralympic Committee Athletics Grand Prix in Beijing back in April. Leow said: "Although I didn't make the qualifying mark (in Beijing), he was really encouraging and gave me the opportunity to represent the country." Though this was a personal best timing for him, Leow admitted that he got carried away with the possibility of winning gold midway through the race. He said: "I was really trying to give us a national anthem (moment) here so maybe that spoilt the plan for pacing a little. "On the third lap, I was trying to chase Timin down but he's better than me at this point of time." He is eyeing a place at the 2020 Paralympics in Tokyo. "Realistically, I will push very hard for 2020. I will be 33 then and it is probably the last chance I have left to race." But he believes his APG medal in itself is a "big step", and hopes it will lead to more funding and support for athletics - be it for able-bodied or para track and field. He said: "Athletics is a bit of an underdog sport in Singapore so, hopefully, this will give the public a chance to recognise it as one of our country's medal contenders." While today's 400m T37 is not his pet event, expect Leow to put in another strong performance. After all, this is a man who did not take no for an answer. It took Singapore swimmer Toh Wei Soong only 1min 21.02sec to surge through the pool yesterday at the OCBC Aquatic Centre. But in that time, he not only won the men's 100m backstroke S8 final but also opened a new chapter in the nation's para sport history. 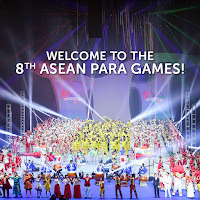 The 17-year-old's gold medal was the hosts' 17th of these Asean Para Games. More importantly, it helped the Republic surpass their best-ever gold haul of 16, achieved at the inaugural Games in 2001. Wei Soong bagged another gold in the evening session when, in front of Deputy Prime Minister Teo Chee Hean and Minister for Social and Family Development Tan Chuan-Jin, he outswam his rivals in the 50m free S8. The Anglo-Chinese School (Independent) student, who now has four golds on his Games debut, said: "The team spirit is amazing, all of us are really pumped up for the Games. "Credit goes to the entire team - it's testament to how much effort we've put in, and how hard we've worked." Singapore's chef de mission Raja Singh was at the swimming venue to witness the milestone. He said: "The athletes are composed and they're all focused on their events so that's wonderful." Asked if he would raise the medal target, he said half-jokingly: "We can set a simple target. "Let's go for 21 first." Moving away from medals, he added: "These Games have created a high level of awareness for disability sports. "We're also looking at bigger numbers in terms of participation, encouraging people of disabilities to come and play. Moving forward this (should be) the key." In all, Singapore's swimmers added five golds, one silver and three bronzes on Day Four of the swimming competition. Theresa Goh started the gold rush with the day's first event, winning the 50m free S5 (S2-S5). Fellow Paralympian Yip Pin Xiu, an S2 swimmer competing three classes up, was an impressive second. She clocked 1:01.23 in the backstroke, and went under the world 50m backstroke mark (1:03.00), although it will not count as an official record as it was swum in a freestyle event. Benson Tan added two golds, winning the 100m back S14 and 50m free S14. Both he and Goh are on five golds. The other medallists were Han Liang Chou (men's 50m free S8), Lawrence Tay (men's 100m back S14) and Wong Meng Ee (men's 50m free S12), who contributed a bronze each. Like Raja, the swimmers were hopeful this meet would usher in a new era in disability sports. Veteran Goh, who has competed in every edition of the Games, said: "There were a few debutants who got gold this year. "It shows how much effort a lot of people are putting into training and pushing forward. "This speaks well for the future." Yip, Singapore's first Paralympic champion, said: "Eleven years ago, when I started, the only (para) athlete that people knew was Theresa. "And they didn't know her like a champion but more as somebody doing disability sport. "Now, the point of view is different. They view us as athletes and we're very appreciative of how much disability sport has grown in Singapore." Wei Soong added: "Hopefully, it can be a stepping stone. "We're going to keep improving, keep going on, one step at a time." In just over a minute, Singapore swimmer Yip Pin Xiu put in a virtuoso performance which exemplified the spirit of the Asean Para Games. Swimming against competitors three classes above her in a one-lap, 50m event with little margin for error, Yip, an S2 swimmer, clocked 1min 1.61sec to win the women's 50m backstroke S5 (S2-S5) at the OCBC Aquatic Centre. In doing so, the 23-year-old not only clinched her first gold of the meet, but also broke the 50m back S2 world record, previously held by China's Feng Yazhu, who swam 1:03.00 at the London Paralympics. Yip caught up with eventual runner-up Nguyen Thi Den of Vietnam and third-placed Theresa Goh only in the last 5m. "I was very nervous but I guess it was a good kind of anxiety that put me in the zone. I just focused on lengthening my strokes, and went into the race taking it as a competition with myself. "I'm so happy that it hasn't sunk in yet. I'm very touched and glad that I'm able to do this on home ground," said Yip. Also in good spirits was her room-mate and fellow Paralympian Goh. The 28-year-old's bid for seven golds from seven events ended when she finished eighth in the 200m individual medley S9 (S5-S9), her first race of the day. However, she remains Singapore's most successful athlete of these Games with five golds and a bronze. She now has 27 golds from competing in every edition of the biennial meet. The breaststroke specialist said: "In the medley, I was racing against swimmers from four other classes so I cannot expect the same kind of result as the past few days. "We're looking forward to the next nine months of training. "The results here show that we are on track for Rio." On the Games entering the final day, Goh said: "It's bittersweet. I'm really happy that I don't have to race already but, everything else, I don't really want it to end. "We really hope the support will continue after the Games." The pair's coach Mick Massey said their performances at the OCBC Aquatic Centre prime them for a possible medal showing at next year's Paralympics in Rio. He added: "We've got a fantastic team... everything is in place for Singapore to go to Rio and bring back another gold medal." Lawrence Tay won Singapore's other gold of the day in the men's 50m back S14, clocking a Games record of 34.52sec. 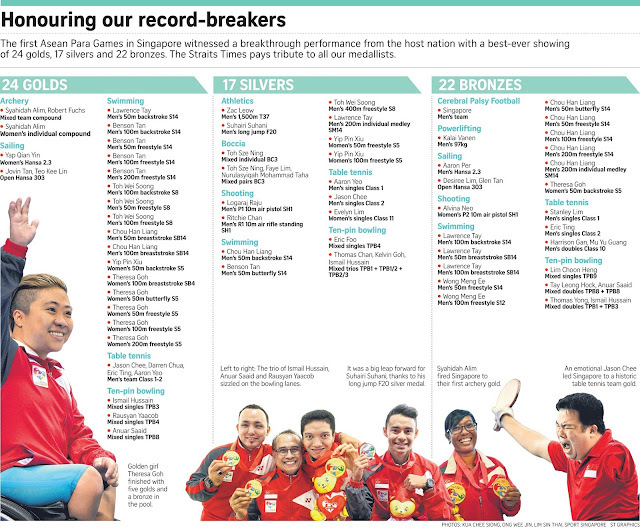 That took the hosts' swimming medal tally to 16 golds, six silvers and 11 bronzes. He finished ahead of team-mate Han Liang Chou (35.94) and Malaysia's Ting Jing Ping (36.32) for his first gold of the meet. Said Tay: "It was a surprise because I had swum in the 200m IM earlier. I was also (nervous) because it was the last race. I want to thank my coaches who have worked very hard with me." The meet drew to a close after five days last night. In all, 36 Games records fell while a world record and two new Asian marks were set. Vietnam were top with 19 golds, 22 silvers and 21 bronzes, ahead of Indonesia (17-17-16) and Singapore. Since a young age, Suhairi Suhani had been told that he was different - and not necessarily in a good way. As he struggled to keep up with his peers in primary school, his family was advised to enrol him in a special-needs institution. Yesterday, at the Asean Para Games (APG), the 18-year-old Singaporean proved he was indeed different - in spectacular fashion. Barely a year after his first competitive leap, he hit the sand in a personal-best mark of 6.66m for silver in the men's long jump F20 final. Just one centimetre separated him from Fadli Amirullah, forcing the Indonesian to settle for bronze. 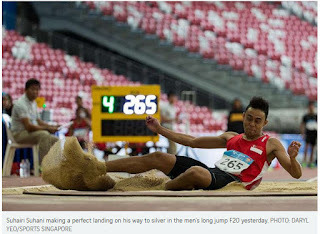 Gold went to Malaysia's world champion Abdul Latif Romly, in a new Asian record of 7.43m. He will likely be joined at next year's Rio de Janeiro Paralympics by Suhairi, whose latest effort met the qualifying mark but awaits International Paralympic Committee certification. The Delta Senior School student - who came in fifth at last year's APG in Myanmar - will become the first Singaporean long jumper to vie for honours at the quadrennial Paralympics. "It is just amazing to get a medal in front of my mother, who has been there for me all the way - looking after my diet and pushing me to keep going strong despite what others say," the beaming teenager said yesterday. "I achieved my goal of stepping on the podium for her." It was his mother Subahariah who would not let him be segregated in the sporting arena, even though he was diagnosed with intellectual disability, brought about by high fever and fits at the age of one. When Suhairi was nine, she encouraged him to compete in a 5.6km cross-country run without any previous training. A love for track and field was born. According to his coach C. Veeramani, Suhairi is obsessed with honing his craft. The duo spend hours analysing videos of his approach, take off, movement in the air and landing. Former national sprinter Mohamed Hosni, who is the youngster's running coach, described his charge as the "most dedicated local athlete I have ever met". He explained: "Rain or shine, Suhairi is at least 45 minutes early for every training session. "He is so eager to learn and correct his mistakes. "Despite what doctors have told him, he is a fast learner." With his place in Rio all but booked, Suhairi aims to continue proving people wrong. He said: "The Asean Para Games is just the beginning. I want to jump further and run faster. "I want to prove I'm not normal but, rather, special." Shifting herself in her wheelchair just before receiving her medal, Yap Qian Yin took a deep breath, then pursed her lips tight. Perhaps, if she kept her breath from escaping, the emotions she was feeling inside would be contained as well. The moment was clearly an emotional one for the 25-year-old sailor, whose strong showing over three days of races saw her crowned champion in the Asean Para Games (APG) women's Hansa 2.3 event. It was vindication, for few had believed that the bold decision to go solo would reap rewards for Yap, who had competed in double-handed boats all along. But it was mostly pride. This time, for the first time since she started sailing in 2011, mum was watching. Mum saw how skilful, how independent and how capable her daughter was. "At the start, there were a lot of doubts. It was a really big step forward," Yap recalled yesterday of her decision to sail solo. "Should I? Did I make the right choice? People were criticising, saying (I) might not be ready, (I) might not win gold." Not only did she finish tops, she also did it in dominant fashion, winning nine out of 10 races for a huge nine-point lead over her closest competitor. She was the youngest among the four entered for the event, and at Class 3, is also the least functional. The Philippines' Cherrie Samonte Pinpin and Clytie Orencio Bernardo claimed the silver and bronze respectively. Said Yap, whose gold was Singapore's 50th medal of these Games: "Proving (my critics) wrong is also proving myself as well." But rather than sail to prove to her naysayers what she was capable of, it was really her mother whom Yap was putting on a show for. Slightly emotional as she spoke of how much her mother's presence at the regatta meant, she said it was neither her superb showing nor the gold medal around her neck that was her greatest takeaway. She said: "It's not results. It's seeing my family, and my mum especially, coming down to support me." In all, Singapore bagged two of the three golds on offer, with veteran Jovin Tan's partnership with debutant Anthony Teo - Singapore's oldest athlete at 71 - paying dividends in the double-handed Hansa 303. Malaysia's Nurul Amilin Balawi and Mustafah Junell took the silver while Singapore's Glen Tan and Desiree Lim settled for the bronze. Jovin had partnered Lim in the Para World Sailing Championships in Melbourne just last week where they qualified for the Rio Paralympics. Both returned to Singapore just days before the APG began. Going into yesterday's races, Jovin and Teo held a one-point lead over the Malaysians while Glen and Lim were a further point behind. Having mentally prepared himself for two intensive back-to-back regattas, Jovin said it was the unfamiliarity of the Marina Bay waters that actually posed a greater challenge. "We had limited chances to train here and we're not familiar with the waters. The conditions are very tricky - the wind comes and goes and it's very unpredictable," he said. Indeed, a day after the races went on without a hitch, the sailors endured a wait of more than six hours before the first race of the day successfully commenced at about 4.30pm. The women's Hansa 2.3 and Hansa 303 events managed to get in two races yesterday. But the lone men's Hansa 2.3 race that was scheduled was abandoned owing to a lack of wind. Singapore's Aaron Per picked up a bronze in the event to take the Republic's tally to two golds and two bronzes, the top-performing nation at the sailing competition. Malaysia took the other gold. Singapore coach Mohamed Zainudeen - in his players' words - "did an Alex Ferguson" during half-time of the cerebral palsy football bronze play-off at the Asean Para Games (APG) yesterday. Boots did not fly and no cups of tea were thrown. But the 46-year-old showcased the Scot's famous hairdryer treatment with a verbal tirade against his under-performing troops. The score was level at 1-1 with Malaysia, and Zainudeen felt his team were sloppy in their passing and were giving their opponents too much space and respect in midfield. "Sometimes, my players need a wake-up call - we weren't competing like we used to so I reminded them of what it means to play in front of your home crowd," he said with a wry smile. "The boys heard my shouts. After the break, they rose to the occasion." In the process, the 3,000-strong crowd at the National Stadium rose from their seats after a burst of brilliance from forward Muhammad Mubarak. Cutting past his marker from the left wing, the 23-year-old unleashed a powerful grounder that clipped the inside of the post en route to the net. It proved to be the winner in a match the hosts should have wrapped up earlier, if not for some wayward shooting and the form of Malaysia goalkeeper Shafiq Zahari. At the final whistle, the Singapore players collapsed onto the turf in ecstasy, mobbed by team-mates and officials rushing in from the bench. "I'm speechless," said captain Khairul Anwar, the team's top scorer with five goals. "This team was formed six years ago with very little support. We had to beg for jerseys and balls. "Now, we have won a medal on home soil. It was all worth it, and I dedicate our win to coach Zai, our very own Ferguson." Inspiring stories abound within the 13-strong squad. Striker Jeremiah Tan has coordination and balance problems in all four limbs and trunk. He stands at 1.54m but is a giant out on the field, earning some of the loudest cheers for chasing down every loose ball. Peter Kam started the tournament as a back-up defender and ended it as the first choice in goal. Yesterday, he was quick with his legs several times to prevent Malaysian striker Sobri Ghazali from adding to his equaliser from 25m in the fifth minute. The hosts had taken the lead inside two minutes when Mubarak's low corner was tapped in from close range by Shafiq Ariff. "Our team will never quit," said Kam, a sales executive. "If you score against us, we will do our best to hit back. If it means fighting for the ball till we collapse, we will do it." The 25-year-old shed tears of joy in the dressing room, adorned with newspaper articles of their exploits this week as motivation. Now that his team are in the public eye, Zainudeen hopes it will be easier to secure sponsors and find more players for future competitions. He said: "We are grateful for all the support at APG but I hope it doesn't end tomorrow. "We are a national team. I hope others will recognise us this way too and we can start to dream of the gold." For now, just like their able-bodied counterparts, Thailand are the regional kings of CP football. The kingdom brushed past defending champions Myanmar 3-0 in the final to earn a deserved gold as the tournament's most expressive and exciting outfit. The 8th Asean Para Games (APG) in Singapore have proven to be a hit among locals with almost a hundred thousand spectators attending the week-long event. Entry was free to all 15 sports offered across nine competition venues and while the atmosphere at popular ones like swimming and badminton was buzzing with near-capacity crowds, lesser-known ones like goalball and football five-a-side were also well-received by the public. 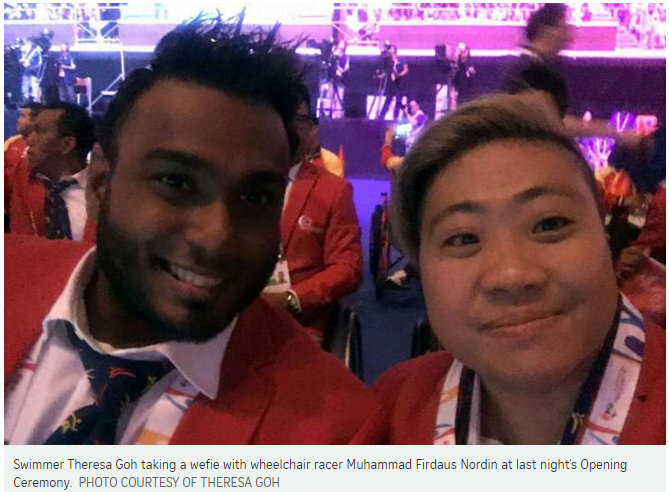 "Usually the crowd (at Singapore Disability Sports Council events) comprise only family members, a few friends watching them play," said chef de mission Raja Singh. "But at the Games venues you can see that huge support from everyone. I have been to many Asean Para Games, and the crowd at this APG is even more than all the rest, you won't see that huge a crowd even at the Asian Para Games." In addition, the APG carnival at the Singapore Sports Hub, which started on Nov 28, drew a total of 442,103 visitors. Said undergraduate Chan Si Yong, 23, who watched badminton, boccia, athletics and cerebral palsy football with his girlfriend: "It is encouraging that people are turning up to watch and cheer the athletes on even though the event is not that big on the world stage; they're here just to enjoy the sporting events." The athletes themselves were overwhelmed by the support showered upon them. The sight of a full house of more than 200 supporters - with several holding placards bearing his name - at the Marina Bay Sands Hall B moved local powerlifter Kalai Vanen. Each of his three attempts on Tuesday was greeted by a standing ovation. Despite being a debutant in a strong Asian-class field, the gym instructor won a surprise bronze medal in the 97kg division. Said the 56-year-old, whose left leg was amputated nearly 30 years ago because of a tumour: "It's fantastic performing in front of the home crowd, thanks a lot from my team to the whole of Singapore." Wheelchair racer William Tan, a Paralympian and veteran of many para sports championships, added: "We were very conscious that fans are behind us, we are invigorated by that to give our best for Singapore." Many of the supporters were friends, family and colleagues of the participants and they were out in large numbers to salute them. Bowler Eric Foo, 27, who has an intellectual disability, had his boss Edmond Ng at the Temasek Club cheering him on. Said Ng, 46, head of operations at international law firm Baker & Mckenzie.Wong & Leow: "Eric has been working for me for six years. His attitude in sports translates into his work, where he is very serious and diligent, so I came down as a small way to show moral support." With the APG being held in the Republic for the first time, the host fielded a record contingent of 154 athletes, more than half of whom were debutants. The level of competition may not have reached the heights seen at the SEA Games in June but spectators were no less impressed. Said IT manager Adrian Ee, 39: "I am inspired by this swimmer whom I saw had just one leg and both of his arms were amputated. "But he was still swimming the butterfly (stroke), which requires the use of the arms the most. But even without his arms, he was still able to do that. It was amazing." Given the physical limitations of many of the 1,200 para-athletes from around the region, it was an eye-opening experience for fans. Mohammad Rosdi, 51, was impressed by the skill of visually impaired bowlers. Said the Singapore Polytechnic lecturer: "I have never seen how disabled people play sports before so it is interesting to see how they position themselves on the lane and hit the pins when even we, as able-bodied people, cannot hit a strike." The ability to control a bowling ball notwithstanding, there were other valuable lessons that spectators - particularly those with children - were keen to soak in. Said housewife and mother of three Josse Tan, 43: "I hope the kids can grow up knowing how to empathise with people with disabilities. "So if they see a disabled person, you don't just question why are they like that, but they learn to see what they can accomplish and do." Six days ago, Thai runner Pranaya Sekratok got her country off to the best possible start by winning the women's 800m T53/54 final, the first gold medal won at the Asean Para Games. Fittingly, it was the Thai contingent who rounded up the event yesterday as they conjured a scintillating 3-0 win over Myanmar in the cerebral palsy football final. With that, the regional kingpins asserted their supremacy in the para sports arena once more as they topped the medal standings after seven days of action. The Thais, who have traditionally won the most golds at the meet, surrendered top spot to Indonesia at last year's edition. They had finished second, three golds shy of Indonesia's haul of 99 golds. This time, Thailand finished clear winners with 95 golds, 76 silvers and 79 bronzes, ahead of Indonesia (81-74-63). Yesterday, Thailand National Paralympic Committee secretary-general Osoth Bhavilai said: "Being first in South-east Asia was always our target, and I'm happy that we did it. The level of competition is getting higher, so I'm very happy for the athletes." He praised the athletics team, who delivered 30 golds. Thailand's Kewalin Wannaruemon, a blind runner who won all three of her events in Games record times, said: "I knew I can do this, and I'm happy to help contribute to Thailand's overall medal haul. We've worked very hard for this." Indonesia chef de mission Faisal Abdullah, meanwhile, is looking forward to the next Games in 2017. He said: "We hope to regain top position in 2017. We have to address some issues and send athletes abroad for training where necessary." Malaysia, host of the next Games in 2017, also enjoyed a good outing in Singapore, finishing third overall with 52 golds, 58 silvers and 37 bronzes. Chef de mission Ang Kean Koo said: "It's good that we achieved both our targets, which were to hit 50 golds and to finish third. "But this is only the beginning for us. We have to start focusing on 2017. "We want to win more gold medals for our country, and if possible, we want to be the overall champions. "We will meet the national federations in the next two weeks to discuss which sports to focus on. Some of the sports we have identified are swimming and some athletics events." The Malaysians opened a Paralympic Sports Centre in Kuala Lumpur last March, and Ang is hopeful the facility, reportedly the largest in South-east Asia, will help them top the medal table. He also praised Singapore's hosting of the Games, highlighting the accessibility of venues and friendliness of volunteers. Ang said: "It's going to be a challenge but we will try to do better." Over the past week, the region's finest para-athletes leapt, raced and dribbled to sporting glory in front of thousands of spectators who cheered and applauded their every effort. 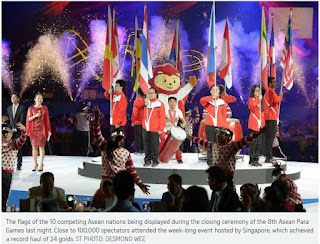 A far more intimate setting marked the end of their journeys at the 8th Asean Para Games (APG) but last night's closing ceremony was no less significant. With the dousing of the Games cauldron at the Marina Bay Sands event plaza, the biennial event was officially declared closed by Prime Minister Lee Hsien Loong. Held inside the Sands Grand Ballroom of the Marina Bay Sands, the APG ended with a jubilant and musical movement by some 400 performers, as well as emotional reels that toasted the achievements of the Games' 1,200 athletes. Just as the Singapore APG had been about inclusiveness, the closing ceremony, too, was a celebration of all abilities and involved even the athletes themselves in the night's festivities. The Games, declared by Asean Para Sports Federation president Zainal Abu Zarin yesterday as the "best Games ever" in their 15-year history, was arguably an unqualified success in all respects. Not just because it was lauded by visiting contingents for its silky operation, or because Team Singapore - first-time hosts - achieved a best-ever haul of 24 golds, 17 silvers and 22 bronzes at the event. It also appeared to emphasise what organisers had set out to achieve - to include, to educate and to demonstrate the extraordinary ability of people with disabilities. Minister of Culture, Community and Youth Grace Fu, who is also chairman of the Singapore APG organising committee, applauded athletes from all 10 competing countries for their display of both spirit and sporting excellence. 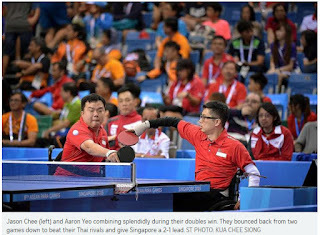 Making special mention of Singapore swimmer Yip Pin Xiu's world record feat, table tennis player Jason Chee's triumphant comeback from his tragic accident in 2012 and Malaysian swimmer Yeo Yi Lin's unyielding will, Ms Fu said: "Their fighting spirit epitomises the values of the APG. "It has been Singapore's honour to host this Games. It has truly been our privilege to be touched and inspired by the courage and determination of our athletes. "I speak for many Singaporeans when I say that what we have experienced in the past week, the life lessons that we have learnt, we will remember and cherish for many years to come." For veteran athletes and officials who have pined for the region's most prestigious para-sport event to be held at home, the past week was everything they had hoped for - and more. Para-swimmer Yip, for one thing, went from worrying about competing to empty stands to holding back tears of joy "every other day". She said: "To me, it's been more than we could ever have asked for. I've never heard cheers for Team Singapore athletes like I have at this Games." 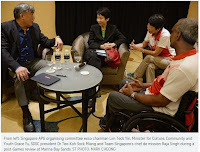 Singapore chef de mission Raja Singh, who is also vice-president of the Singapore Disability Sports Council, is hopeful that the momentum built by the APG will translate into more milestones for disability sport. Challenging both experienced athletes and debutants to strive towards loftier goals, he said: "We cannot just be happy about what we've achieved here, (and must) raise the standards to the next level - that's a key part of our next mission." As the confetti and curtain fell on the Games last night, it was away from the public eye and with deep reflection that many athletes and officials marked the end of the 8th APG. Said Yip: "I don't know if I'll ever experience this again. This Games will forever be a part of me." The first Asean Para Games (APG) held in Singapore drew to a close yesterday but is expected to leave a legacy that lasts beyond last night's closing celebrations. With close to 100,000 spectators attending the week-long event, the 8th APG showcased the athletic skills of people with disabilities to a wider public and in doing so, altered perceptions. Success for Singapore came on several fronts. This was the Republic's best showing at the Games, with a record 24 golds to surpass the 16-gold haul from 2001. Organisers will hope it has also paved the way for a more inclusive Singaporean society. Prime Minister Lee Hsien Loong, the guest of honour at the closing ceremony at Marina Bay Sands, said: "All of you have done your best. I congratulate you for your efforts. I hope you've made new friends and you'll take away good memories." He was joined by Minister for Culture, Community and Youth Grace Fu at the Sands Grand Ballroom. Thailand were crowned overall champions again with 95 golds, with Indonesia second wth 81 golds. President Tony Tan Keng Yam wrote in a Facebook post yesterday: "They (the para-athletes) are role models on how we should focus on what we can do to be the best that we can be regardless of circumstances." Kuala Lumpur, which staged the 2001 and 2009 editions, will host the next APG in 2017. Even as Team Singapore bask in the bounty of a best-ever haul at the Asean Para Games (APG), officials are already looking ahead - to do better for people with disabilities, engage more of them and help disabled athletes hit higher targets. The completion of a successful APG, the first to be held in Singapore, merely signals the continuation of a journey in which there is still much that can be done. For one thing, the officials are keen to ride on the momentum built from a stellar showing at home - the Republic won a historic 63 medals, including 24 golds - to expose more people with disabilities to sport. Minister for Culture, Community and Youth Grace Fu is hopeful that more will be spurred to believe that sport, even at the elite level, is possible for people with disabilities. "That's probably where the Games can make the biggest impact," she said during a post-Games review yesterday at Marina Bay Sands. "Not the 152 or so athletes who participated - but maybe the thousands, and tens of thousands of people with disabilities who can start taking up sport and, hopefully, some will make it to the excellence level," she added. Plans are already afoot to introduce measures that will strengthen the disability sports scene in Singapore. Ms Fu had revealed last week that Centres of Expertise in disability sports will be set up at five ActiveSG sports centres, and a full list of other recommendations is expected early next year. 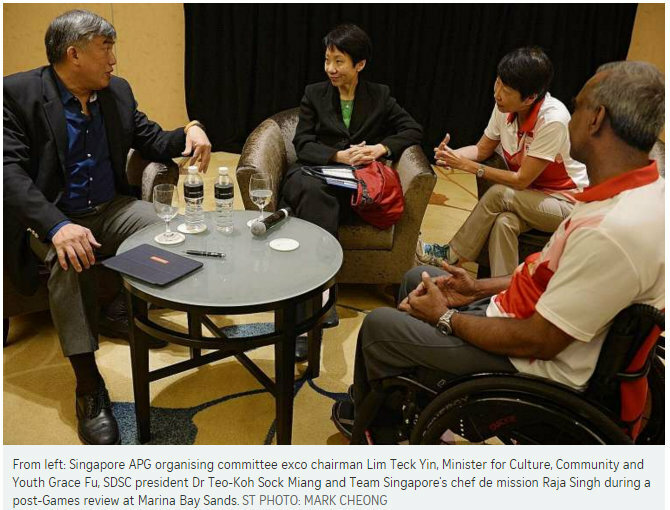 Ms Fu, who is also chairman of the Singapore APG organising committee, added that the Games have also shed light on improvements that can be made in both infrastructure and programmes for people with disabilities. "(The APG has) taught us the potential things we can do to make training facilities more accessible," she said. "The blueprints we'll talk about early next year will be about improvements we can make to both 'hardware' and 'software'." Grassroots competitions, noted Singapore Disability Sports Council president Dr Teo-Koh Sock Miang, are possible avenues that will allow athletes with and without disabilities to compete and participate together. Hopes of taking disability sport here to the next level are encouraging, with many among Singapore's participating para-athletes - 60 per cent of whom were debutants at the APG - eyeing competition beyond the regional level. Said Sport Singapore's chief executive officer Lim Teck Yin: "Even among debutants, they are interested in becoming a Paralympian. "At the APG level, we have to start work now. "We've got to get working on bringing on some new blood and letting the current athletes play their part in coaching, sparring and mentoring." Added Dr Teo-Koh: "Even those who didn't win any medals are committed to represent Singapore and want to be counted to be there at the next Games." But just as high performance in able-bodied sports is based on a broad pool of athletes, disability sports also need to be built on a similarly strong foundation. Said Ms Fu: "In order to have a team at the very high level, you need to develop from the ground. "These are all visions that we have for disability sports. It's going to be a lot of hard work, and the hard work of many stakeholders that have to come together. "It's not going to be easy but I think what the Games has shown us is the possibilities of what the human spirit can do to overcome physical constraints."